Only the victim of a crime may request the Office of the District Attorney to drop charges against (or decline the prosecution of) a defendant. The District Attorney’s Office has a no drop policy on Domestic Violence matters and this Drop Charge Request is not available. 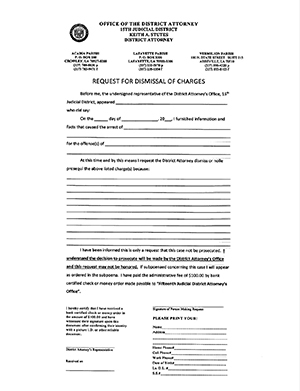 Click here to download the Request for Dismissal of Charges form. You will need to appear in person at the main office of the District Attorney. You will need to document your request on a “Drop Charge Affidavit” explaining why you wish the Office of the District Attorney to decline prosecution. A copy of this form can be printed here. You will need to provide a $100 user service fee in money order form at the time of your affidavit. Your affidavit will then be forwarded to the prosecutor handling your case and will be filed with your case record. The prosecutor may want to meet with you and will consider your request along with other factors including the severity of the crime, the likelihood the defendant will re-offend, the threat posed to the community by the defendant’s actions, and the strength of your case. THE SUBMISSION OF A DROP CHARGE AFFIDAVIT DOES NOT REQUIRE THE PROSECUTOR TO HONOR YOUR REQUEST. The decision to prosecute or not rests with the Office of the District Attorney. Your request, while important, is only one of many factors our office considers in proceeding with a criminal prosecution. NOTE: Any payments made to the District Attorney’s Office, including drop charges, must be made in the form of a money order. Our office cannot accept cash or personal checks.